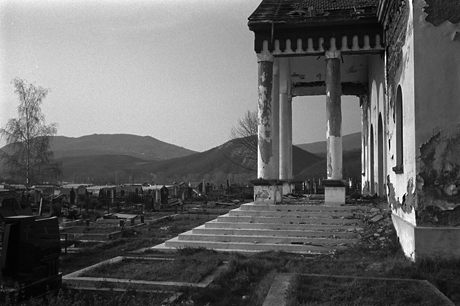 Serbian Cemetery. Mitrovica, Kosovo. 2009. This will seem like an odd photo choice for a Family Blessings post, but you will see how this connects in my mind. You may disagree, but at least you will see my logic (or lack thereof, depending on your assessment.) This photo was taken the week leading to Easter, another holiday strongly associated with family, in Kosovo. While in Kosovo (also, Kosova or Kosovë) I visited the ancient city of Mitrovica, the flashpoint in several clashes between ethnic Albanians and Serbs, both during the 1999 war and in 2004 when the drowning of a Albanian child in the Ibar river ignited riotous clashes resulting in deaths on both sides of this river that physically and ethnically divides the city. 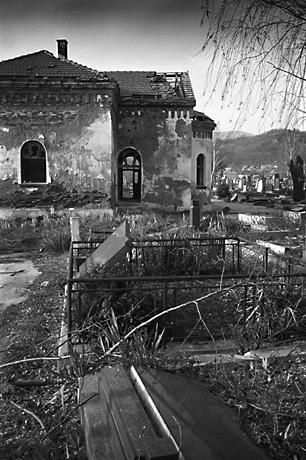 This Serbian graveyard is located on the Albanian side of the river where Serbs once lived in relative peace among the Albanian population. Now it is merely one more symbol of the ethnic division and hatred in Kosovo. All the gravestones display in Cyrillic script the names of loved ones, family members now gone. Not one of these headstones remains standing, they lie smashed and desecrated among the overgrown roots and grasses. And there they will remain until there comes a time when their family members will be able to right these remembrances of loved ones lost. That is not soon to come. As I walked through this cemetery, some of the faces etched in fractured marble looked up at me from the dirt while the others lay face down. These were fathers, mothers, brothers, and sisters. They were essentially no different than those family members who will gather around your table for Christmas. They represent the joyful uncle or the loving grandmother, yet they remain broken and unvisited; the result of ethnic hatred. So you ask, where is the family blessing that this post heralds? It is in the knowledge that during this time in the west (the U.S., the U.K., etc.) we can peacefully enjoy those with us and remember those who have past . We have the blessing, at this time, of peace here at home. We are not divided by ethnic hatreds and strife. Yes, there are isolated acts of evil, and we do have loved serving selflessly in dangerous areas of war, but few in the west have a personal knowledge of such a hatred that caused them to flee home and belongings in a desperate attempt to avoid murderous mobs, only to return to a razed shell of a home and a divided city. That is foreign and incomprehensible to us. We have the blessing at this time to enjoy friends and family in a time of domestic peace and security. However, this is not something that should be taken for granted. We should give thanks to God for such a time as this. These placid times will not long endure, they have not in human history and they are foretold to surely end in the future. But, as Christians we don’t live in the past or the future, we live in the security of God’s present blessings and should give thanks. While visiting Mitrovica, I asked my Albanian driver when UNMIK and KFOR (the U.N. organizations set in place to keep peace in Kosovo) would be able to leave. He answered, “Never. If the U.N. leaves, there will be war.” Clearly, there is no political solution to the ethnic strife in Kosovo. The only real solution is a spiritual one, and that is not a solution the U.N. is able to offer.